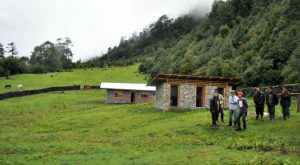 Visit to the ethnic group in eastern Bhutan, with a culture and tradition very unique from the people living in lowlands. They live a semi nomadic life and the valley is believed to hold the mythical Yeti. It was recently turned to a tourist hotspot by the government. The trek is part of community-based tourism that benefits local communities. Extra fees (such as government entry fees, camping fees, use of local staffs, and each night in the villages locals hosting cultural show and dances) are a necessity. Along with the trek, you will visit the valleys of Bumthang, Punakha, the capital Thimphu and Paro, which are all quintessential Bhutanese treasures. This tour can be done on optional basis by starting from Paro and ending at Samdrupjongkhar as per convenience. Arrive in Guwahati airport in Assam, India. 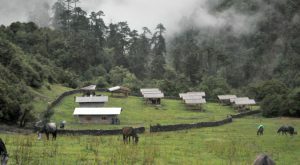 Meet our representative and drive to Samdrup Jongkhar, a frontier town in southeastern Bhutan. In the evening stroll around the town to see the locals. 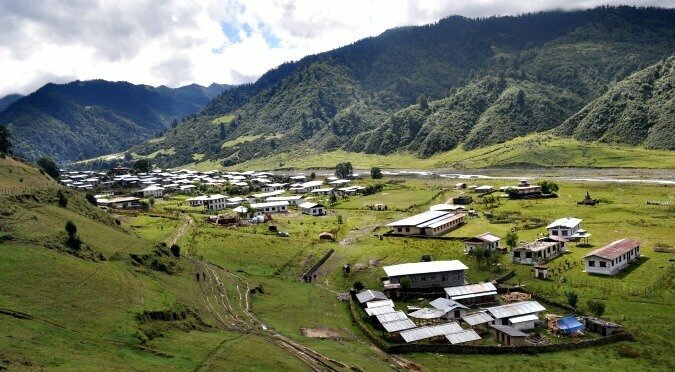 Samdrup Jongkhar is a trade hub for eastern Bhutan. After an early breakfast, drive north to Trashigang. En-route you can visit to a local weaving center in Khaling. Later in the afternoon, we will visit Trashigang Dzong, administrative center for the valley. 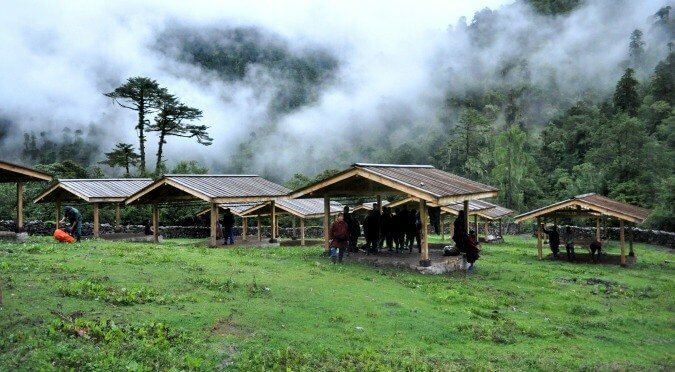 Drive to Tashiyangtse, visit Gomkora temple, Doksum village along the way. In Trashiyantse, visit Traditional Art School, Chorten Kora and stroll around the village and its small town. Return to Trashigang for overnight. Approx.19km, 5-6hours, 1210m ascend and 200m descend. From Trashigang drive for 1½ hr. to the road end at Chaling at 2135m. 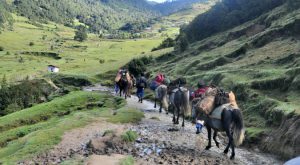 Along with crew, begin trekking with gradual climb towards Shaktimi meadow, with yaks and sheep grazing with some yak herders’ huts scattered on the hillside. Continue the climb to reach Mendula Pass at 3345m. After the pass it is all downhill through the rhododendron forests till campsite at a beautiful meadow known as Donmong chu by the river at 3145m. Approx. 10.5km, 3-4hours trek, 396m ascend. Trek along the Donmong Chu River through the rhododendron forests and shrubs. There are no steep climbs today and the trail in most part follows the river bends, gradually gaining the height. 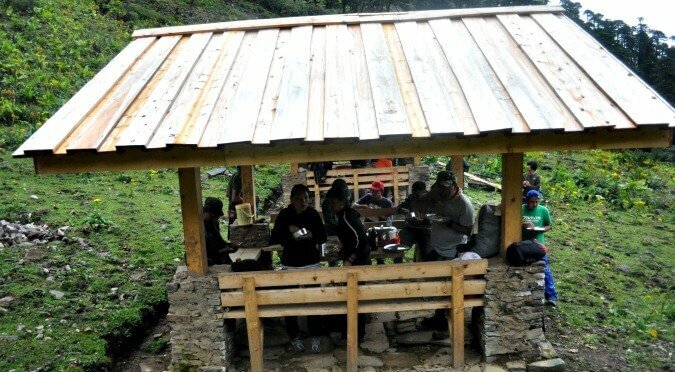 The first village we will come across is Gangu (3430m) and after another 45 minutes, we arrive at a large Merak village located at an altitude of 3520m. Toughest journey on this trek with the crossing of the highest pass and there are also a few smaller passes and ridges. Start early from the camp, towards the east with a gradual climb to the first pass at 3900m. 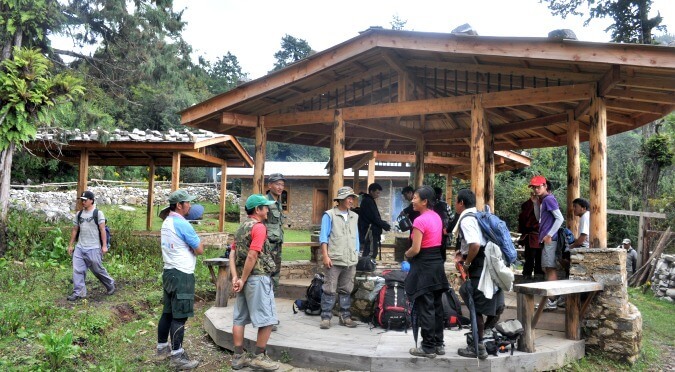 Continue thereafter along the tree line till we reach Nachungla Pass at 4150m. 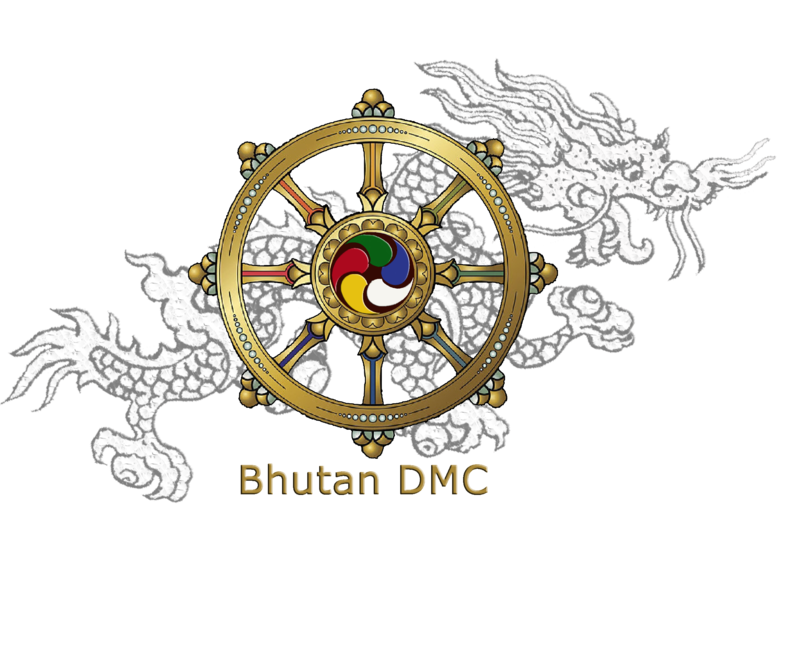 Catch a glimpse of 360 views of Bhutan peaks, Arunachal and Tibet. From the pass, it is a long descent to Miksateng village campsite at 3060m. Approx. 6.5km,2-3hours, 81ascend and 310m descent. 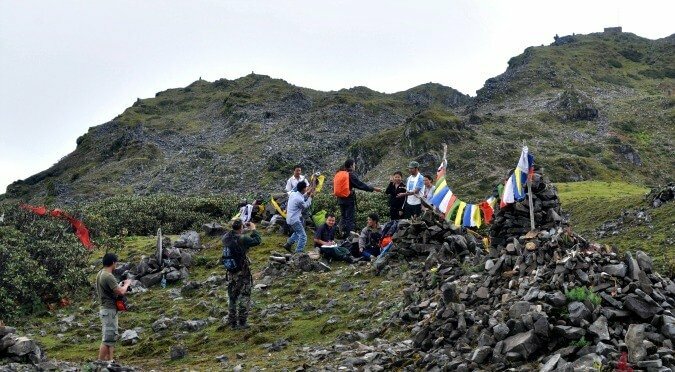 After breakfast, descend down to the river and gradual climb towards a small pass with a small chorten (stupa) on the hill overlooking the Sakteng valley. 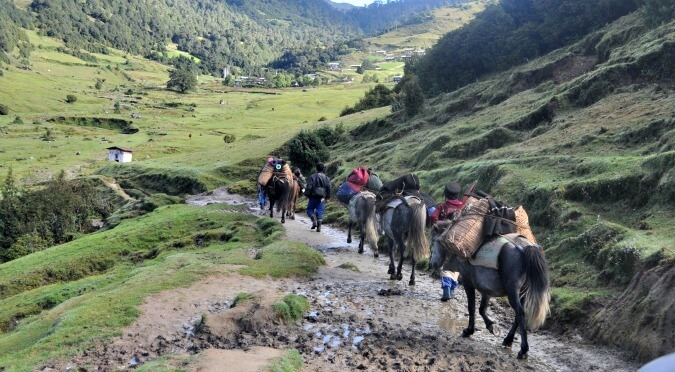 From the ridge, we descend down to the valley, cross the river into Sakten village at an altitude of 2950m. Today is a well-deserved rest day. In the morning, visit the village, local homes, temple, meet with people, who are happy to converse with you. See the lifestyle and unique living culture of this ethnic group. You can also visit local School. In the afternoon, there may be people coming over to perform cultural show for you. Brokpas have a unique yak and ache lhamo dances. You can try the local liquor with a special ceremony. Approx. 17km, 6-7 hours, 74m ascend and 1291m descent. Today’s journey is a long and gradual descent. Start early from the camp. 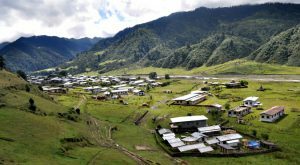 Leaving Sakteng, Our campground is right next to the river, whose roaring sounds combined with deeming noise of beetles, makes the sleep very pleasant at an altitude of 1750m. Approx. 8km, 2-3 hours, 320m ascend and 300m descent. Our last day of the trek begins with short climb through Joenkhar Teng and a long descent crossing suspension bridges and short climb to reach Phongmay (1770m). Meet our transport team and drive to Mongar town, which takes about 5hrs via Trashigang. After breakfast, we begin a long and spectacular drive west to Bumthang, across Thrumshingla National park, through ever changing vegetation and landscapes, rich in bird and other wildlife. 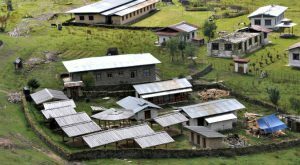 We also pass through many small hamlets and villages along the way and we will stop to visit few of them, arriving in Jakar in the evening. Bumthang is justifiably regarded as the cultural heartland of the kingdom with its many temples, holy sites, languages and traditions. We spend the full day in and around Jakar visiting its important monuments and cultural sites and local villages. After breakfast take a long drive to Punakha. 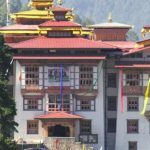 From Jakar, cross into Chumey valley, then across Yontongla pass, we arrive in Trongsa, where we stop to peek at the Tower of Trongsa museum and also see the impressive Trongsa Dzong. Trongsa Dzong is one of the largest fortress in Bhutan. Traverse Pele la pass (through Black mountain national park) and descend into semi-tropical Punakha-Wangdue valley, where we arrive in the evening. Visit Punakha Dzong, a former winter capital of Bhutan, located at the confluence of two rivers. Then drive up to Dochula pass, where we stop for lunch and to get the panoramic mountain views of eastern Himalayan peaks (weather permitting). Afternoon, visiting Thimphu’s sights including traditional art school, Zilukha nunnery, Takin (national animal) sanctuary and, Tashicho Dzong. 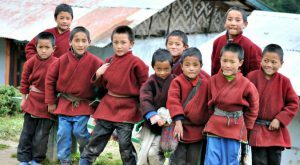 Spend the full day around charming Paro valley, where we will visit National Museum, Rinphung Dzong and beautiful 7th century Kichu Lhakhang temple, Dumtse Lhakhang, Dzondrakha cave temples and local farm houses by short walks and drives. 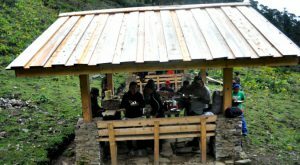 All camp meals, snacks and refreshment. Situation or other conditions beyond our control. All other cost not listed in "included" section.